The Transfer of Property Act of 1882 talks about transfer of a movable or immovable property by way of a gift. Section 122 of the said Act defines Gift as the transfer of certain existing property (movable or immovable), of which transfer is made voluntarily i.e. without any coercion or duress of any form and there is involved no question of any consideration whatsoever, but only natural love and affection. The person so transferring the property through a Gift Deed is known as the Donor and the person accepting such transfer is known as the Donee. It is pertinent to mention here that the donee must accept the gift within the lifetime of the Donor and while the Donor is still in a position to give, meaning thereby that he shouldn’t be an insolvent. And in case the donee happens to die before accepting such a gift, then the gift shall be deemed as void. Read further to know about the gift deed format, registration procedure as well as the important points to be included in a gift deed. How Can An Immovable/Movable Property Be Transferred By Way Of Gift? The Act enumerates the procedures as to how an immovable property can be transferred by way of a gift. A transfer can be effected by way of a registered instrument which needs to be signed by the donor and also attested by a minimum of two witnesses. For the transfer of movable property by way of a gift, it can be effected by way of a registered instrument like in the case of immovable properties or by delivery, in a manner that is similar to how normal goods that are sold are delivered. A gift can only be of an existing or present property and not of any future property. Section 17 (1) (a) of the Registration Act of 1908 makes it necessary for all instruments of gifts of immovable property to be registered with the sub-registrar of the area where the whole property or a part of it is situated within 4 months from the date of execution. A document shall come into effect from the date it was executed and not the date on which registration took place. Non registration of a gift deed would lead to no title over the property being transferred. The gift deed which is not registered will not be deemed valid in the eyes of law and wouldn’t even be admissible as evidence. Hence, mere execution of a gift deed is no good. Until and unless it is duly registered, there will not be any transfer of title or interest over the property to the donee, and the donor would continue being the owner of the property. What Goes Into A Proper Gift Deed? Absolute Absence of Consideration – The gift deed needs to mention that the donor is transferring his property by way of gift out of natural love and affection and ther is involved no monetary consideration. There should be absolutely no element of consideration involved. The transfer shall cease to be a gift if this important aspect of no consideration is not met. No Coercion – The transfer should be voluntary and it should not be out of fear, undue influence, misrepresentation, coercion or duress of any kind. It should be gratuitous. The donor must have clear intention to make a gift and should be well aware of the consequences that will ensue once the transfer is effected. Donor, The Owner Of The Property – Nobody can transfer a better title than he himself has. At the time of transferring of the property by way of a gift, the donor should be the actual owner who is seized and possessed of the property, the property should be existing, gift of a future property is not admissible. He should also be the one paying taxes and levies accruing on the scheduled property. Description of the Property – A gift deed should provide a proper description of the property that is being transferred eg: area, built up area, address where the property situated etc. Additional Rights – This includes all rights, liabilities, easementary rights that are appurtenant to the property in question. Relationship between the Donor and the Donee – This clause needs to mention as to how the donor is related to the donee, whether by blood or otherwise. Donee’s Rights – The gift deed should clearly mention the donee’s rights to possess, occupy and enjoy the property. The donee also has the right to accrue rent, profits etc and the donee shall have the right to use the property for his/her own use and it should be free from all legal actions, lawsuits whatsoever by the donor or any of his heirs , assigns etc. Delivery of Possession – Delivery can be express or implied and some affirmative act needs to take place for it to constitute delivery. Donee should be given the vacant and peaceful possession of the gift property. All liabilities, taxes, penalties, levies etc need to be borne by the donor till the possession is given to the donee. After which all these will be borne and discharged by the donee. Stamp Duty Assessment – The value of the property in question should be ascertained for the purpose of ad valorem stamp duty. Witnesses – The gift deed needs to be executed in the presence of at least two witnesses. A gift deed needs to be duly accepted by the donee. Acceptance suggests that the donee has accepted the gift wholly and unconditionally. If the gift is not accepted by the donee, the gift will become void. The donee must accept the gift after it is executed even before it is registered. How Does LegalDesk Come Into The Picture? We, at LegalDesk, understand the problems people face scouring tonnes of sites looking for properly drafted legal deeds and documents. And that is exactly why we have a set of document templates that are legally verified. There are a zillion templates on gift deeds available online but do you actually have the one that is specifically customised to suit your needs? 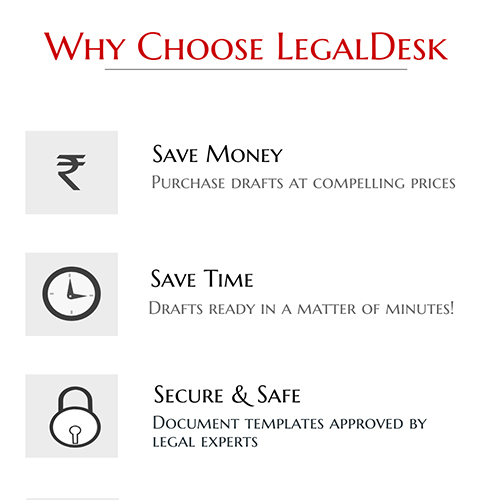 Now, you have nothing to worry as LegalDesk is the answer to all your legal issues. You can create a Gift Deed within minutes, using the ready to use, lawyer-verified template of Gift Deed available on our site. You can also create a host of legal deeds and document templates on our site and have us print it on Stamp paper and deliver to your doorstep. There are 2 comments on "Gift Deed Format In India". My father has two brother elder and younger my father elder brother divided the property between brothers but didnt transfer names on property but later dispute arises between father and elder father..
Now they want to transfer the name means they want my father to take property of my fathers share on my fathers name whether they can execute gift deed my elder mother means elder fathers wife ready to transfer….plz let me know if whether name transfer of property which is in my fathers share but on my elder fathers name…can be transferred through gift deed….